Last November's election confirmed that something is not right in America. The real problem is that something is different this time - & that something is evil & a deliberate deception to overrun our country (although Sam Donaldson tells us that it is not our country any longer). The recent scandals re the IRS, Benghazi, & First Amendment abuses highlight the tip of the iceberg – EPA discriminations, Verizon telephone account monitoring, & Susan Rice being appointed National Security Adviser just add to BO's poke in America's eye with a sharp stick. BO prime delegation personifies evil in implementing & adding to his anti-American agenda since January 2009 - including Secretary of HHS Kathleen Sibelius, CT Senator Richard Blumenthal, NY Governor Andrews Cuomo, former EPA administrator Lisa Jackson, & of course Harry Reid & Nancy Pelosi. These are people who can exchange ideas with BO & MO so that their anti-American policies are not only continued but embellished. I distinguish these people from the group of useful idiots who don't add many original destructive ideas themselves but carry out orders. Put Hillary & Bill in either category as you choose but MO will have the last laugh over Hillary in 2016. Now @ the very top of BO's list of evil people is Attorney General Eric Holder. 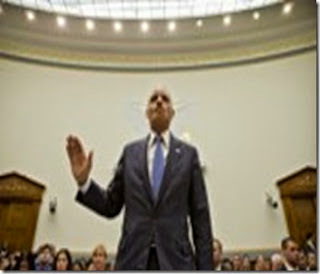 Holder cannot even raise his forearm to a 45 degree angle while being sworn in – see above pathetic photo. Other than MO no one more than Holder shares BO's personal philosophy of destroying America. In summary Holder wants to disarm Americans, arm enemy Mexican gangs, audit patriot Americans, & stifle reporters First Amendment rights. Holder is a cabinet officer who strongly supports citizen restrictive gun control while he is in charge of thousands of armed federal agents, many of them paramilitary agents with machine guns. As is anyone who rises to the position of AG Eric Holder is a man of accomplishment. Holder was an associate judge of the D.C. Superior Court under President Reagan, a U.S. attorney for Washington, D.C., deputy attorney general under Bill Clinton, & was senior legal advisor to BO's presidential campaign, & is now the first black Attorney General. But Holder's list of evil starts with his strong support of restrictive gun control (Holder co-signed an amicus brief in the District of Columbia v. Heller hand gun ban case supporting DC's ban on handguns while arguing that the Second Amendment is a "collective" right, not an individual one) while simultaneously playing key roles in the government's use of force against its own citizens at Ruby Ridge Idaho and Waco Texas – both in the 1990s. Holder also worked on the Clinton undercover operation PATCON (Patriot Conspiracy) which has ties to bombers McVeigh & Nichols in Oklahoma City much like he more recently did with firearms in the Fast & Furious project – a botched federal gun running sting operation that allowed weapons to reach Mexican drug gangs that resulted in the deaths of hundreds of Mexicans & @ least one U.S Border Agent. During Fast & Furious Holder became the only cabinet member in U.S. history to be held in contempt of Congress. Both Waco and Ruby Ridge are now known to have been PATCON inspired Department of Justice plots. The idea of all of these plots was that they would end with the DOJ crushing the civilian opposition. Do your own research to determine how much Holder was involved in each. In the final hours of the Clinton administration Holder was the key person responsible for the pardon of fugitive billionaire Marc Rich, who renounced his U.S. citizenship and moved to Switzerland to avoid prosecution for racketeering, wire fraud, 51 counts of tax fraud, evading $48 million in taxes, and engaging in illegal trades with Iran in violation of the U.S. embargo following the 1979-80 hostage crisis. Holder was willing to do this in exchange for Rich's contributions of millions in cash in exchange for the favor. Holder played a key role in sending federal agents to kidnap six year old Elian Gonzalez @ gunpoint from the protective home of his family so that the Cuban youth would be deported & sent back to Castro from whom he had escaped. Holder dropped the voter intimidation case against the New Black Panther Party from election day 2008 @ a Philadelphia polling place where Party members were recorded on YouTube in paramilitary garb with one wielding a nightstick & obviously intimidating voters. No reason for the dropping of this case has ever been given. Earlier this week Oklahoma Congressman Jim Bridenstine presented his own list of abuses on the House floor & concluded "The president's dishonesty, incompetence, vengefulness and lack of moral compass lead many to suggest that he is not fit to lead. The only problem is that his vice president is equally unfit and even more embarrassing." Overhauling America begins with contrite. . .buckle your seat belts we’re in for a rough ride.